2009 was my first real year for public blogging. I was able to watch and talk about pretty much every one of the 162 games played by the Mariners this year, I got to go to both the coldest (Opening Day, at around 30F) and the warmest (Blue Jays, at around 100F) games I’ve ever been to, and earned a new, more clear understanding of what it really means to be a fan (and I thank the ECS in part for that). My focus was on the bullpen for the 2009 Mariners, but there was also so much more about that lineup to be amazed at and proud of. 2009 was housecleaning, rebuilding, and regaining respect that we lost so much of in 2008 (as Mike Salk would say, Jack Zduriencik “settled all family business” all Goddfather-style). There is little I can say here about 2009 that I haven’t said already, but coming in third place has never given me so much (sports-related) joy and happiness. Keeping tabs on trade rumors has never had me so riveted to my computer screen, giggling like a maniac and talking to myself. It’s been an amazing year for Mariners baseball. And with New Year’s Eve and Day, we’re looking at sort of the hump day of the offseason. Two more months must now go by before Spring Training games start to be broadcast on the radio and TV (hopefully? Please, FSN, PLEASE!) There are less than 60 days before pitchers and catchers report to Arizona. Less than 120 days before the 2010 Seattle Mariners start the 2010 season, and we finally see for ourselves whether all the cheering for Cliff Lee and worry over Milton Bradley was actually worth it. About 90 more days – give or take – for the front office to make their trades and gel up the final roster for the year. 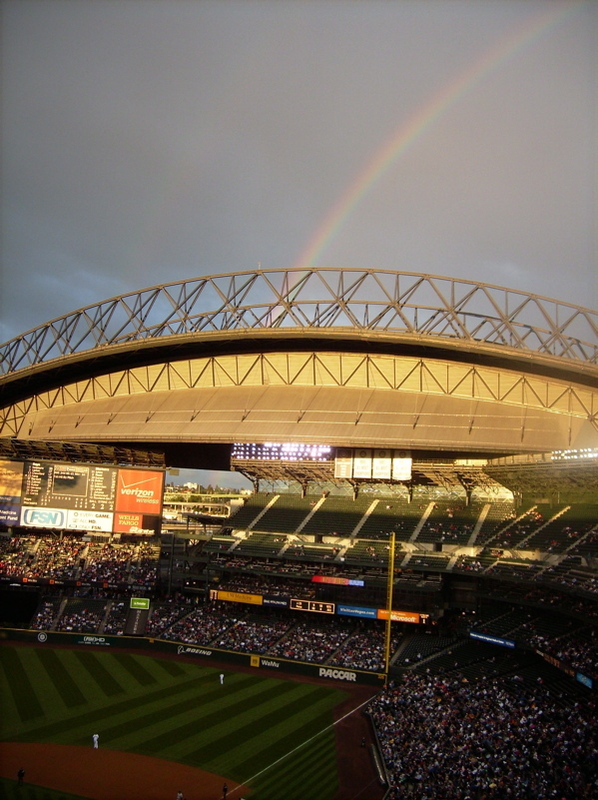 Less than 5 days before the first Mariners Mondays (starts January 4th, according to reader Craig D)! For myself, I have “met” many people online that I hope to actually meet in real life in 2010. And to anyone who has ever dropped by here – whether on purpose or just via search engine, and even if it was just to laugh at my inane ramblings – thank you so much for reading my site. Thanks are also due to all the other blogs who have linked me – it means a lot to someone who is just starting out, trust and believe – and thank you to those of you who come here on a regular basis to read and comment; even if there are just five of you. Before I start sounding like I’ve just won a Grammy, I just want to wish everyone a happy and healthy New Year, and a joyous and safe New Year’s Eve. I have enjoyed reading your blog in 2009, and think you’re doing a good job! Very readable. BET – I really, REALLY wish someone would publish a SABR for Dummies sort of thing – seriously, it’d be helpful to people like me who hate numbers but would like some further understanding. I hear that there is a book out there that is a good read on the explanation of advanced stats, but I can never remember the title, and what is easy for some to understand might not be as comprehensive for others. Anyway, thank you both! 2010 is looking pretty sharp! Is the book “Understanding Sabermetrics”? Maybe? Someone on LL told me once, but it was earlier last year, and I couldn’t remember if my life depended on it. I agree – the easier it is to understand, the less intimidated people will be by it, and the more intelligent fans can and will become.